My kitchen is getting crowded. There is a little girl in this house who is nudging me out in order to let her give the world of baking a try–solo baking. 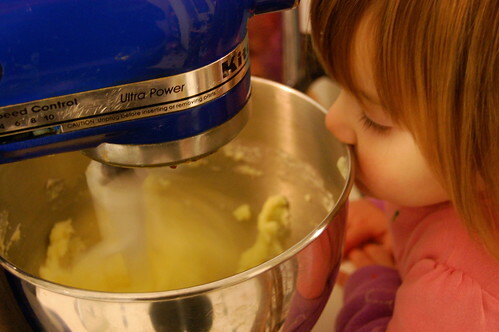 And no, contrary to this first picture, it is not Elizabeth–who finds my ailing KitchenAid Mixer very mesmerizing. Rather, it is Emma. to pull them all together into her own recipe box. 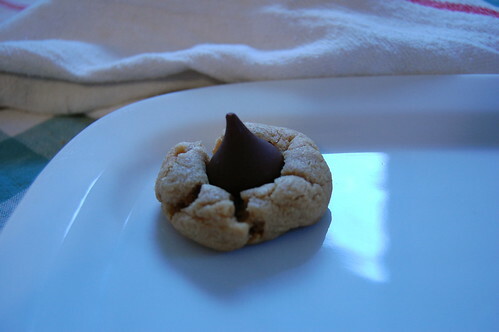 This recipe is one of her favorites–Peanut Butter Kiss cookies–and she can make them completely on her own except for a little help with measuring the sticky peanut butter. It may be time to add a WonderCup to our kitchen supplies. Anyway, a number of people who left comments asked me to address why I homeschool. Honestly, I was pretty hesitant to share. In fact, I'm pretty hesitant to talk about homeschooling much at all on the babycenter blogs. I just don't want to hear all the negativity. (though there were a lot of supportive comments on my first homeschooling post.) But when I thought about it more, I decided to go ahead and share my reasons for homeschooling. It's easy to talk about it here on my personal blog–so many of you homeschool and those of you that don't, don't give negative reactions to the fact that I do. And I'm really, REALLY thankful for that. But in the end, I decided that these are MY REASONS for homeschooling, not some philosophy on how schooling should be handled for all children, not some mindset I'm trying to shove down the throats of anyone who will listen. There will always be nay-sayers and furrowed-brow onlookers. So, for those of you who have sent me emails in the past and asked for me to share my reasons for homeschooling you can check out my post, "A Bushel and A Peck: Week 22: Why I Homeschool." Excellent post, my friend. It’s hard to put yourself out like that, and we all learn so much when someone takes that risk. Thank you. I’ll do some recipe digging for you. That is such a great idea, writing out the recipies like that! It’s so wonderful when kids develop that kind of competence! As a teacher and a parent, I totally understand why you homeschool and have even felt tempted to do it myself. Good for you for doing that, Molly!!! I homeschool my daughter and I completely understand your misgivings about sharing that with everyone. I feel that negative vibe usually when I talk about it. I also find that I am always having to defend the fact that I homeschool. I just wanted you to know that we are in this together and I feel your pain (hope that helps). I think it says so much more about you as a wonderful mother that you are willing to sacrifice so much for your children. This is the best book… (http://www.amazon.com/good-measure-cookbook-children/dp/0931018013/ref=sr_1_1?ie=UTF8&s=books&qid=1229321455&sr=8-1) I learned to cook from it and we have a later copy here in the house now. It shows pics for every recipe (just like the Mollie Katzen books do too– and like yours) and the recipes are easy (just right for Emma’s age). I can’t recommend it enough. What a great way to help a beginning baker. As for the comments you have been receiving over at babycenter I it frustrates me that people feel the need to attach any ones personal choices they have made in their life. By the way your article was beautiful. Just a quick response to the peanut butter problem: I just learned –last night!– about using displacement to measure things like peanut butter and shortening. To measure 1 cup of peanut butter, fill a 2-cup measure with 1 cup of very cold water & add peanut butter until the water reaches the 2 cup mark. Can’t believe I’ve gone so long without hearing about this! Hi Molly,I absolutely LOVE your illustrated recipe idea and will most definitely be copy-catting you in a couple years! My 4-year old just loves helping with baking and cooking and I know she will be all over it the day I let her do something all herself! The recipe card is a wonderful idea. I need to make Katie a recipe box and let her have a go. How sweet the recipe card is – what a good idea! I will have to try baking with my son, when he gets a little older. The cookies look delicious! Love the recipe cards – I might even write up a few easy recipes like this for Christmas or Advent for my 5yr old as she loves cooking and would love to do it on her own. Any suggestions for cooking with young kids and using eggs? I have a 2-year-old who loves to bake with me. I’d like to make Christmas cookies with her and let her roll out the dough and use cookie cutters, but I don’t think she’ll keep her hands away from her mouth and I’m concerned about the raw eggs in cookie dough. Is there such a thing as pasteurized eggs? Where would I find them? Any words of advice? i have a question, and then i’m heading over to look at your homeschooling artice (my in-laws, both public school teachers, are visiting, and defending homeschooling is on my mind…) -my 6 yr old loves to cook as well, but i have not let her use the oven or stove all by herself – do you step in and help here? if not, how have you gone about this??? ?thank you! i lurk here often and enjoy it very much. I left a comment over on your article but I wanted to leave another one here. I think you are doing such a great job with your kiddos. 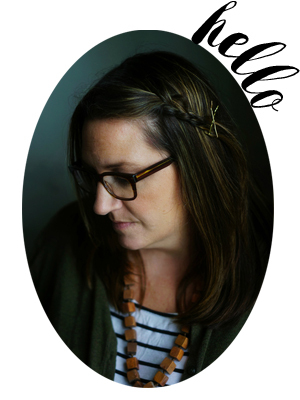 I get such inspiration from your blog and come away with the feeling of how much concern and love and time that you put into your kids education. Bravo! im planning to write of my dreams someday, can i copy one of your pics and add blogs link above it? Thanks for sharing that recipe. 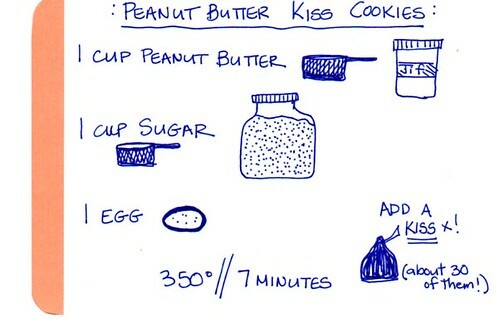 I love how simple it is, no excuses not try it, and peanut butter cookies are one of the few things all three of my boys all enjoy! Will definitely be printing out your recipe card, it’s charming. I just happened upon your blog today and I look forward to returning. Again, thanks for sharing! I love that you drew the recipe for your daughter! My kids would love that. I adore your recipe card- what a wonderful tool for your child. And trust me, your drawings are SO much better than mine! I can barely draw a stick figure so I am mighty impressed 😉 Happy Holidays!! I love your little illustrations.. and I admire you bravery in allowing the kids to cook by themselves! Mine are still young, but I worry I will have a hard time stepping out of the kitchen when the time comes. Maybe we’ll start with your peanut butter cookies! Excellent post. Thank you.All kids would definitely love that..
Gonna give a try:)A wonderful tool for sticky type ingredients…Ur recipe card is adorable:)Glad to visit ur post..